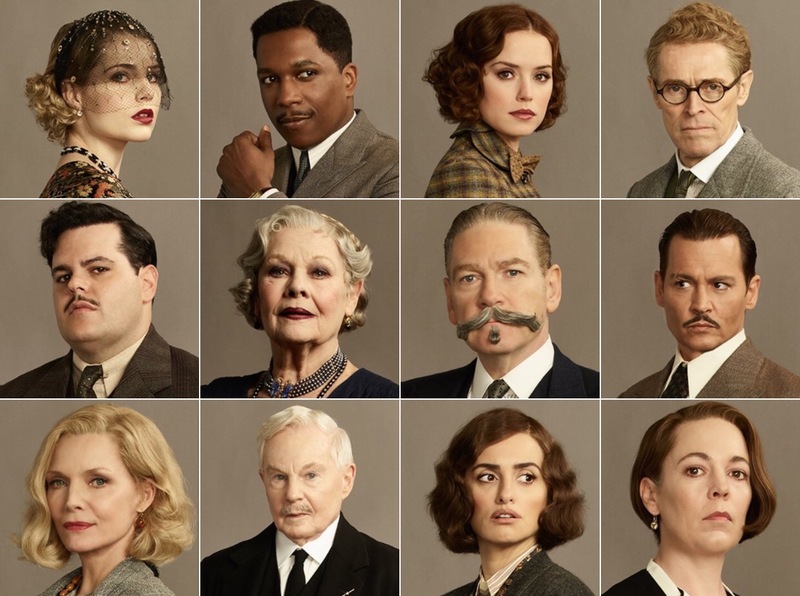 You can’t make an Agatha Christie film without notable actors anymore. Apparently it’s just not allowed. 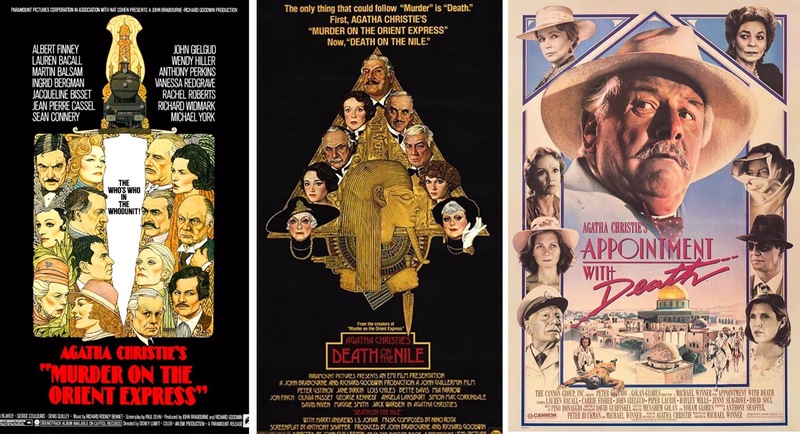 You used to be able to, the handful of adaptations that came out in the 50s and 60s; Witness for the Prosecution, The Alphabet Murders and those Margaret Rutherford Miss Marple movies, didn’t appear to be all about the cast. 1974’s Murder on the Orient Express seemed to irreparably change things though. Sidney Lumet’s film filled the famous train full of stars including Ingrid Bergman, Lauren Bacall, Sean Connery, John Gielgud, Jacqueline Bisset and Vanessa Redgrave and other film makers followed suit. The Peter Ustinov Hercule Poirot films of the late 70s and 80s also brought in Bacall and Gielgud along with Hayley Mills, Jenny Seagrove, Carrie Fisher, Bette Davis, Angela Lansbury, Mia Farrow, Maggie Smith and David Niven and like Murder on the Orient Express the posters made a big thing of the big name cast. 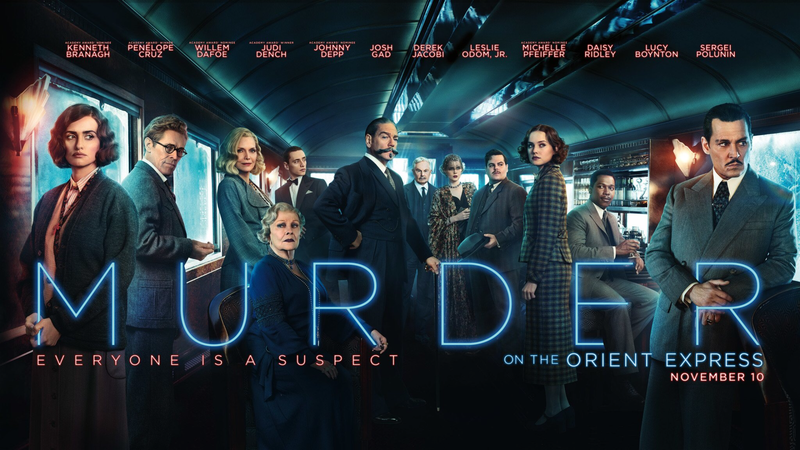 So it was that more recently when ITV did their version of Orient Express as part of their long running David Suchet as Poirot series they also went for a more recognisable cast than they normally employed, drafting in David Morrissey, Toby Jones, Barbara Hershey and Hugh Bonneville. (They also had Jessica Chastain but she wasn’t well known then.) Similarly true to this form the current run of BBC Christmas Christies is also using actors with several significant film credits to their name. 2015’s And Then There Were None featured Charles Dance, Sam Neil and Miranda Richardson, last year’s Witness for the Prosecution had Kim Cattrall, Andrea Riseborough and Toby Jones again and next month we will get Ordeal by Innocence with Bill Nighy, Alice Eve and Matthew Goode. Not all household names but all familiar faces. Yep, tradition now seems to dictate that whodunnits should also be a bit of a who’s who. Here then we have Kenneth Branagh’s new big budget take on Murder on the Orient Express inevitability filled with people from some of cinema’s biggest franchises. Star Wars, James Bond, Pirates of the Caribbean, Batman, Spider-Man, Harry Potter and the Disney Princess movies, they all have representatives along for this ride. If you are going to make the cast the main draw, which once again is what the marketing is doing with this film, the question has to be do they merit the hype? I won’t be comparing Branagh’s company against those that have played the parts before but I will compare them against one another because ranking things is a tradition on this blog. 14. Olivia Colman plays Hildegarde Schmidt, the maid to Judi Dench’s ageing Russian princess. When you have a actor of the calibre of Coleman coming at the end of a list like this then you know the film isn’t finding enough for its cast to do. This is the problem with looking to fill almost every part with a performer who has been celebrated as the lead in something else. Rather than working as an effective ensemble the movie almost comes across as a sequence of cameos. Coleman is good, of course she is, but she gets little chance to shine other than at one point showing off her German. 13. Similarly Judi Dench herself barely features. This isn’t her fault and it isn’t the fault of Branagh as the director. The film just can’t accommodate everyone and allow them to do their best work. Dench still manages to carry her usual gravitas and understated dignity but she can’t be on screen for more than ten minutes. Also, her initial brusqueness doesn’t really sit with the later reveals about her background and her relationship with Hildegarde. I know it’s in the book but they’ve not made it work on screen. 12. Leslie Odom Jr. is one of the least known of the cast and plays the part of the Doctor well enough but he is a little bland and one note. 11. Lucy Boynton, so good in Sing Street, only really gets one scene as Countess Andrenyi but she plays it really well. Unfortunately her husband, the Count, played with intensity by Sergei Polunin comes across as a bit of a caricature. 10. Moving away from the comedy sidekick work he has done, most notably for Disney, Josh Gad gives a convincing performance as the secretary stressed by his dealings with his criminal employer. This may well lead to other dramatic roles and it seems that Gad is up to the task. It is a shame they used the guy to generate some pointless action scenes though as his motivations didn’t really make sense on these occasions. It just felt like they were shoe horning a chase in. 9. Again Willem Dafoe doesn’t get a great deal to do as the professor but when Poirot sees through him it leads to some nicely played moments. 8. Penélope Cruz plays the strictly religious missionary women and is able to bring some depth and emotion to proceedings. Playing a little against type Cruz gives one of the standout performances. 7. Daisy Ridley is the Governess and is given more opportunity than most to convince as a woman totally incapable of being convincing. Seriously, she makes no secret of the fact she has secrets. 6. It’s a part even smaller than most of those in the movie but Manuel Garcia-Rulfo brings real energy to his role of the amiable car salesman. It is impressive that he can impress with so little to do. 5. Like most of the cast Derek Jacobi gets only one significant scene but he is a strong presence throughout the whole film. He is the butler but in this case no one seems to be assuming that he did it. 4. Johnny Depp probably gives his best performance here since Sweeney Todd. He has finally moved away from the man child roles he has spent so many years doing, to the point that we’ve seen it too many times and he’s started to get too old to do them. His gangster is a little bit of a trope but Depp brings an easy charm, a dangerous menace and even a convincing vulnerability. If he can do as well as Grindelwald in the next Fantastic Beasts film then casting Captain Jack Sparrow in that part may not be the mistake that people fear. 3. One of the best performances is actually given by one of the actors to feature least in the publicity. Tom Bateman is really good as the manager on the train and assistant to Poirot. Like Garcia-Rulfo he brings a compelling energy and instant likability to his character. His introduction is a little fumbled setting him up in a way that seems unnecessary and possibly even misjudged but they get past it. 2. As a director Kenneth Branagh does a very fine job. The film is artistically shot and well put together. It all feels epic and old fashioned just as a story of this nature should. Of course taking the lead role is a different challenge and one that immediately invites comparison to those that have played the part before. Perhaps wisely Branagh the director, Branagh the actor and Michael Green the screenwriter have tried to do something different with this Poirot and if this hasn’t worked it is Green’s fault rather than Branagh’s. This version of Agatha Christie’s famous detective has weaknesses and moments of emotional indecision and doubt that will sit uneasily with Christie purists but they are played effectively. The more familiar parts of the character are handled well by Branagh too; the fastidiousness and the polite but direct way of addressing people. Better than Ustinov and Finney then but not as good as Suchet. 1. In the end I think the film belongs to Michelle Pfeiffer. She plays the widow who is very much playing the widow and Pfeiffer gets a chance to demonstrate flirty lightness, intelligence, determination and anguish in almost equal measure. It is a varied but believable performance and it holds everything together almost as well as the lead. This new Murder on the Orient Express is a highly atmospheric and enjoyable movie that updates everything just as much as it needs to and not an inch more. There is more story here than the two hour running time can handle but that is true of so many book adaptations and if you enjoyed it then that leaves many more treats waiting for you on the page. To get the most out of it you need to be a fan of this sort of thing without being too much of a fan of Agatha Christie but it pays reverence to one of her more meticulous stories even if it plays a little loose with her most meticulous hero. There is also a film adaptation of Crooked House coming out soon.